This nearly 50-foot prototype of the Next-Generation Canadarm can compact for transport in a small spacecraft. The Canadian-built robotic arms built for NASA's space shuttle fleet and the International Space Station are about to get two new siblings. Last week, the Canadian Space Agency showed off the Next-Generation Canadarm (NGC) prototypes, which were unveiled after three years of development at Canadian company MacDonald, Dettwiler and Associates. The mechanical limbs are the successors to the shuttle fleet's Canadarm and station's Canadarm2, which played pivotal rolls in the station's construction for more than a decade. The CSA and MDA plan to use this technology to position Canada for newer space business opportunities in areas such as in-orbit refuelling of satellites, said Gilles Leclerc, the agency's director-general of space exploration. "We prepared all these new systems so that we will be well-positioned for the next thing in space," Leclerc said. However, the Canadian government's $53.1 million contribution to the arm project (as well as supporting testbeds and simulators) has only brought them to the prototype stage so far. The arms will require more money for launch configurations and a ride to orbit. The other NGC prototype arm is a miniature, at 8.5 feet long (2.58 meters). Like the station's Dextre robot, which it is modelled after, it will be able to refuel satellites, grapple tools and manipulate items such as blankets that cover satellites. Manufacturer MDA has spent several years touting the benefits of satellite refuelling, which the company says would save money since satellites could be kept aloft longer if they can receive more after launch. In March 2011, MDA signed a $280 million agreement with Intelsat SA to advance this concept, but the deal was scuppered in January 2012 after receiving lukewarm interest from potential customers. NASA is also considering robotic refuelling. There is debate among Canadian space circles as to whether MDA could contribute to NASA's project, since it is a Canadian company. MacDonald, Dettwiler and Associates hopes to use this nine-foot Next-Generation Canadarm prototype to advance orbital refuelling. The CSA's contribution to NGC came from one-time stimulus funding it received in the federal budget between 2009 and 2011. Now, the agency is trying to figure out its priorities in the next few years amid large budget cuts, and with future government funds to NGC in flux. The agency is doing an internal review to determine its priorities with the lesser budget, said Leclerc. Work on the International Space Station will come first, since the Canadian government agreed to take part in the station until 2020, he said. CSA's approach will be to "maintain signature technology to develop" while placing resources where it can, he said. The agency's priorities will also be determined by an external review of the Canadian aerospace sector that should be submitted to the government in the coming months. Canadarm has a cherished spot in Canadian space history because its success eventually led to the astronaut program. The first Canadarm flew in space in 1981 on STS-2, the second space shuttle mission. NASA was so impressed by the robotics that it invited the Canadians to fly payload specialists on future shuttle missions. The first Canadian, Marc Garneau, flew in 1984. He has since called it a "pay-to-play" arrangement. Subsequently, Canada provided four more Canadarms to NASA between 1981 and 1993 (one was lost on Challenger), as well as the next-generation Canadarm2 that was installed on the space station in 2001. Over the years, the arms have grappled satellites, hoisted astronauts and assisted on construction and repairs to the International Space Station. One of the original Canadarms was converted into an orbiter boom sensor system, a 50-foot extension for shuttle arms built to inspection orbiter heat shields as part of safety procedures implemented after the loss of Columbia in 2003. The boom remains on the space station today, in the wake of the shuttle's retirement. Three first-generation Canadarms remain. NASA kept one for engineering analysis and "potential future use," according to NASA spokesman Michael Curie. 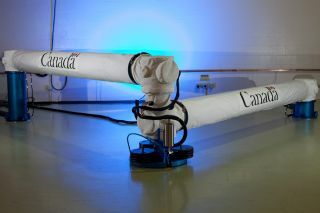 A second arm is being refurbished at MDA before being shipped for display at the Canadian Space Agency headquarters near Montreal. The third is on display at the National Air and Space Museum's airport annex, the Stephen F. Udvar-Hazy Center, near space shuttle Discovery. The arm and spacecraft arrived at the museum at the same time arrived at the same time in April 2012.